“THE RIVER THAT Flows Both Ways” is located between Lake Tear of the Clouds and the southern tip of Manhattan in NEW YORK. It flows 315 mi (507 km) and empties into the ATLANTIC OCEAN. Its low and high tides, along with its salty water, account for the river’s bidirectional water flow. The Lower Hudson River (an estuary) is the dwelling place of a wide variety of plants and animals. Tidal marshes (called Meadowlands) filter the water that passes through them, and over 200 species of fish inhabit the river. The Hudson is located on the Atlantic Flyway and provides food to birds migrating in this north-south corridor. Its base of limestone rock enhances the river’s ability to manage common pollution. In 1609, the Englishman Henry Hudson, captaining a Dutch ship, stumbled upon the river in his search for the legendary Northwest Passage. 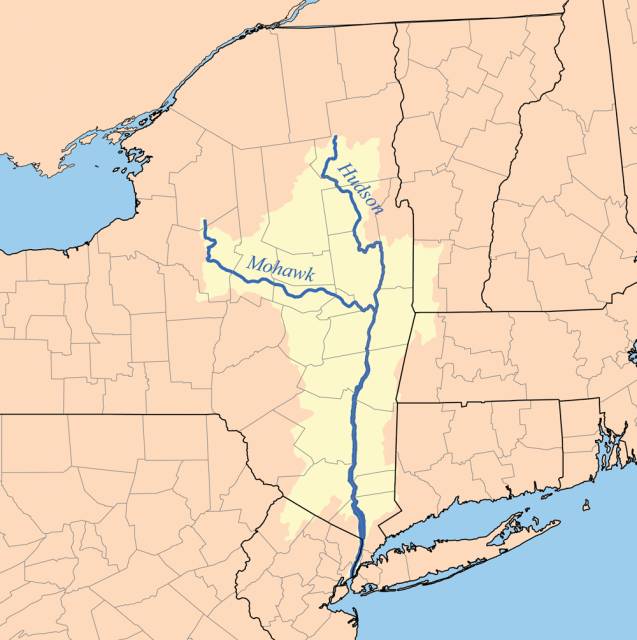 At the time, native tribes already occupied the 4 million acres of the Hudson Valley, which expands from its narrow watercourse from below Waterford until the approaches to the Palisades Cliffs in NEW JERSEY, across the river from New York City. The indigenous population called the valley’s river, Mukheakantuk, which means “Great Water in Constant Motion,” or “The River That Flows Two Ways.” The Dutch first named it “River of the Prince Mauritius”; it was not until 1664 that the English named it after Henry Hudson. During the American Revolutionary War, the Hudson River facilitated the transportation of troops and supplies from the port of New York to military campaigns taking place to the north. The completion of the Erie Canal in 1825 enabled water transportation to cross upstate New York, all the way to Lake ERIE, and from there, farther into the Great Lakes region. The canal system made the Hudson River viable for significant trade along the Atlantic and deep into the American heartland. The Hudson’s visual landscape found wide application by artists seeking a characteristic backdrop for their paintings depicting the lush New World. The first major artist known for his sketches inspired by the Hudson River Valley was Thomas Cole. His sketches became an inspiration to other artists, and the Hudson River School of Painting was formed. Today, these works of art are located in the Historical Society of Newburgh Bay and the Highlands in Newburgh, New York. After the Revolutionary War, ferries became popular for transporting citizens across the river. But river cruises and ferry transportation in general declined with the increase in pollution, which rose to dangerous levels in the mid-20th century. Once the source of drinking water to many cities, the Hudson River experienced a time when companies and residents dumped anything from caustic chemicals to motor oil to discarded food into it, bringing about levels of toxic pollution that rose to a level lethal to humans who swam in it. Over the years, actions from residents and the government have been successful in the cleanup and restoration of the river. One of the most recent actions was an Act of Congress in 1996, which designated the Hudson River Valley National Heritage Area. Despite the river’s ghastly polluted past, the Hudson River is now in better condition than many Atlantic Coast estuaries. Its cruises have become popular again. The George Washington and Tappan Zee bridges span the river and provide a view of the Palisades cliffs for its travelers. The Metro-North Hudson River line railroad serves as a commuter line and as a means of transportation for residents and visitors to visit shops in many valley cities, including New York itself. As a geographic route to New York City, the hijacker piloting one of the planes that struck Manhattan on September 11, 2001, used the river to navigate the plane south from the Boston area.